Similar to most domesticated animals, cats are not necessarily the type of creatures that are to be trained. And unfortunately, it can be difficult to find ways to occupy cats when they like to do activities on their own time. Playing fetch or “wrestling” are not options for most cats. However, it is still important to keep cats happy and content. One of the best ways to accomplish this, is to provide them with different toys and activities that they can use at their personal discretion. These toys, for most owners, can vary from store-bought to homemade, but they all work just the same. Or, so they think. It turns out, some popular types of toys for cats are, in fact, rather dangerous for them and can cause sickness or even death. Below are some reasons why cats need certain types of toys, the toys that are bad for your cat, and the best toys for cats that can benefit both the cat and the family! Cats are very active creatures (despite their reputation). Most are rather anxious and constantly move around. They need to be mentally stimulated in order to keep aggressions and anxiety low. Without it, most cats will “lash out,” biting, clawing, and sometimes even scratching their owners and breaking the skin. This is not done out of hatred or spite for the owner; it is simply a manifestation of the negative emotions they have building up inside of them. It is important to give cats the outlets to work out their anxieties and energy on their own time (since, in line with their reputation, they do everything on their own time). Anything stringy: despite the stereotype, string, ribbon, yarn, and rubber bands are actually quite dangerous for cats. The risks of swallowing the strings or ribbon could result in choking or blocking the airways, leaving the cats defenseless. Cats have tongues covered with rearward-facing barbs that make it hard for them to spit out things that rub against the grain. This means that the cats would not be able to choke up the swallowed string. If this does not cause instant choking, it would then cause their intestines to twist up and would need to be worked on, which can be a rather expensive procedure to reverse. Fishing pole type toys: although these are fun and safe to play with when the owner is around, they can be dangerous without supervision. Typically, the strings are easy to swallow and may result in choking. Also, chewing on the (typically) wooden rods is not safe either, since the little wooden chippings can easily fall off and be ingested by the cats. Only use these with proper supervision, putting them away when not in use. Decorated Toys: although the cute doll with long strings of hair seems like a good option for a cat, it can actually be rather dangerous. Extra accessories on chew toys, such as string, ribbon, plastic pieces or yarn can be chewed off and eaten if not careful. It is best to choose toys that are made of a single, durable fabric that can withstand the chewing and clawing of a cat. Stuffed and Fluffed Toys: Although, as people, we love soft stuffed animals with squishy beads or fluff on the inside, they are dangerous to cats and to all other pets. Once the toy gets ripped or chewed open, it typically will spill the beads, which will hurt the cat if they are ingested. It is best to avoid all stuffed, fluffed, or beaded chew toys, in order to keep them out of the mouths and stomachs of your furry friend. Most good, safe toys for cats have a common theme: no excessive parts. For cats, the toys will spend most of their time in your cat’s mouth, so it is important to resist buying the cheaply made, sparkly toys that claim to be good for cats. The only thing truly good for your cat is a soft chew toy or a bouncy ball to chase. Anything that gets them moving in a safe and contained area is the best solution. Below you will find some of the best and safest toys around. Before using, be sure to check their instructions for any safety precautions to take. In some cases, it might be better to store some of the toys away while you are not home or not paying much attention, in order to prevent your loving cat from doing some harmful damage to themselves or the toys. All in all, the toys below are safe, fun, and can benefit you and your cat in tremendous ways! Rubber toys: chewy, rubbery toys are perfect for cats, as they typically do not shed and are not capable of being chewed to pieces (at least the kind with thick plastic). There are some toys that have tunnels down the middle of them that can hold treats or other incentives. These can get your cat moving and biting, working out all of their inner energy. With their durable layers of rubber, they are promised to last a long time. Knit Toys: knit toys tend to last a little longer. Although they are not as durable as rubber, they are easier on cat’s teeth. Be sure to find knit toys that do not contain any of the fluff or beads that can hurt or injure cats, if ingested. The best knit chew toys are those that have no stuffing at all. It is best to use these types of toys for younger cats or kittens that may not have fully developed or strong teeth yet. LED Lasers: the best types of toys are those that can be shared between the cats and their owners. Lasers are good for just that. They keep cats moving and motivated for quite some time, and allow the owner to be in control of the fun. Be sure to control the laser, moving it quickly and randomly to maximize your cat’s movements. Be sure to only play this game with one cat present. Too many can cause fights or altercations (such as them running into each other). Be direct with movements of the laser, being sure only to move it to practical, easily-accessible places for your cat (not on the wall, around sharp corners, or high on the ceiling) as this can frustrate the cat more. Note: do not leave the laser laying around when you are not present. Chewing on this could result in injury for your cat! Rubber balls: playing toss is not just for the dogs! Cats love to chase around a rubber ball. They are not easily gnawed on, so the likelihood of them popping is small to none. Instead, your cat can use this as a substitute for that beloved ball of yarn. 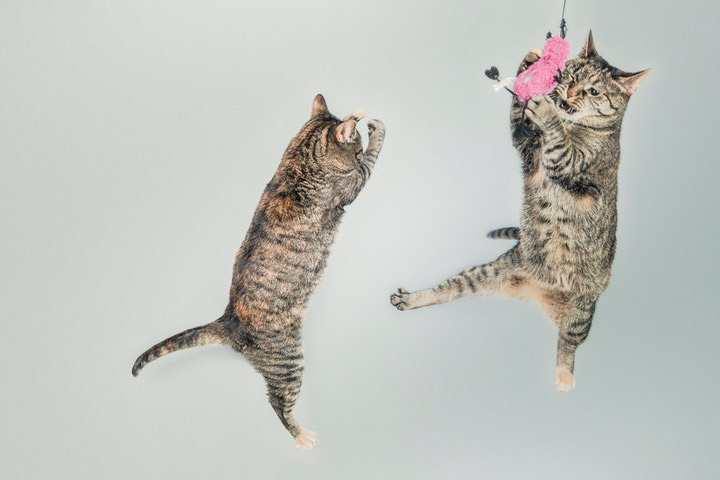 Tossing it, hitting in, pouncing on it, and rolling around with it are just some of the exerting activities that cats can perform with these toys. They are safe to leave out while you are away, since they are rather durable and resistant to chewing and stray pieces of rubber getting into the unwanted mouths! Scratching post: while not exactly a toy, a scratching post is essential to any cat’s happiness and wellbeing. The scratching post has a lot of benefits for a furry feline; they help to dull claws, they release anxiety, they stimulate the brain and body, they work out energy, and they really enjoy it! Scratching posts are available in all shapes and sizes, and made out of carpet, scratchy material, or what can only be described as an enlarged loofah. All of these materials are great for cats to play with and can help reduce the anxiety of not being active in the household. Fishpole Toys: although these have mixed reviews by users, fishpole toys have the same effect as the laser toys. Moving them sporadically and randomly helps to get your cat moving in a contained environment, except with this toy, they can actually catch something! This is typically a cat’s favorite toy, and changing the toy on the end of the pole leads to never end fun when it involves “fishing” for some quality cat time. It is important however, to store toy away whenever you are gone, due to the issues above. Overall, cats too, can be man’s best friend, if that best friend provides the best and most efficient toy for their cat. However, the dangers of some toys on the market are not a concern for big companies, as they place value on the price rather than the safety of your loved pet. If your cat is showing signs of anxiety, depression, hyperactive behavior, excessive gnawing, chewing, or biting, or even hissing and aggressive behavior, a change in toys might be just the thing needed to boost their self-esteem. Let them release some energy, and get back to being the cuddly kitty that you fell in love with. Contact Paw Pals Pet Sitting for more information on our pet sitting services.